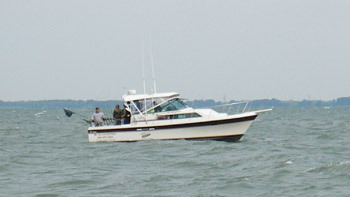 Our boats, the "Mi-Hi" and the "Mi-Hi too" are 32 ft. Wellcraft Coastal's. They have 12' beams, which means plenty of fishing room for your salmon, walleye or perch fishing party of up to six persons. They are equipped with the latest electronics, electric downriggers, outriggers, auto-pilots, GPS units, ship to shore radios, color fishfinders, and radar. For your comfort, a full stand-up head, and galley below.